Periodontology – Dental Clinic "FREEDENTS"
Periodontitis is a dangerous infectious disease dental tissues, which entails the destruction of the supporting apparatus of teeth, threatening the loss of the past. Periodontitis occurs equally often as adults and children and is one of the most common ailments zubno-jaw apparatus, this disease leads to loss of teeth of older people. How periodontitis starts: First plaque is postponed to the tooth surface, followed by further sediment “fall” under the gum. The toxins produced by microbes that live in the plaque irritate gums and provoke the development of chronic inflammatory process, resulting in damaged soft tissue supporting the teeth. Eventually formed wasteland between the tooth and gum where permeates more and more bacteria and disease evolves zubno-gingival space increases. Typically, this stage of the disease flows almost imperceptibly, without causing particular discomfort, but if you do not ask for help, then mount the tooth is completely gone and the tooth will not save. If you notice the host one or more of the following symptoms of an urgent need to contact specialist: 1. blood on your toothbrush. 2. The sensation of itching in the area of the gums. 3. Pain during eating and brushing teeth. 4. 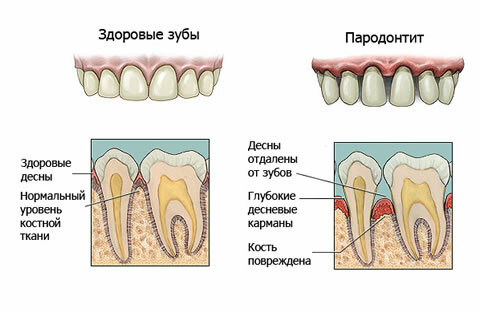 Plaque deposits on teeth. 5. There is some mobility of teeth. 6. Feeling unpleasant taste in the mouth. 7. Bad breath. For its part, we suggest you to treatment and prevention of periodontal disease itself established the German superbly hardware complex called “Vector”. He shows excellent results in the treatment of periodontitis, as it combines the latest advances in dental technology.